Aduki bean squares would be nice served as a side with udon noodles and veggies, or a fresh salad. Now that I’ve bestowed upon you the facts of a bean-eating life in my post, The Birds and the Beans, it’s time for me to figure out what to do with all those soaked beans! I decided to share an oldie but goodie—this is something that my friends and I used to make occasionally with aduki beans. I suppose three decades ago we convinced ourselves that this dish could be a vegan substitute for a popular dessert. I’m not going to say what that dessert is because I think it’s obvious from the photo and the ingredients. Besides, I am not presenting it here as any such substitute and not even as a dessert. 1. Soak the beans in the kombu and cook them as described in The Birds and the Beans post. 2. Roast the walnut pieces by laying them out on a baking sheet–single layer–and baking them at 350 until they start to smell aromatic. Take them out at that point. 4. Combine the miso paste/barley malt with the beans and mix thoroughly. 5. Simmer the bean and miso/barley malt mixture. Barley malt will thicken up like a soft candy so just get the mixture simmering and that’ll be enough. 6. Add the walnuts and put the mixture into a 9 X 9 inch pan and let it cool. Refrigerate it to make it even more firm. This will firm up really well and you can cut it in little squares. You will find it has a savory, slightly salty, slightly sweet taste. A small serving will be all you’ll need at one time. This is a great snack for anyone doing physical labor or athletic activity. 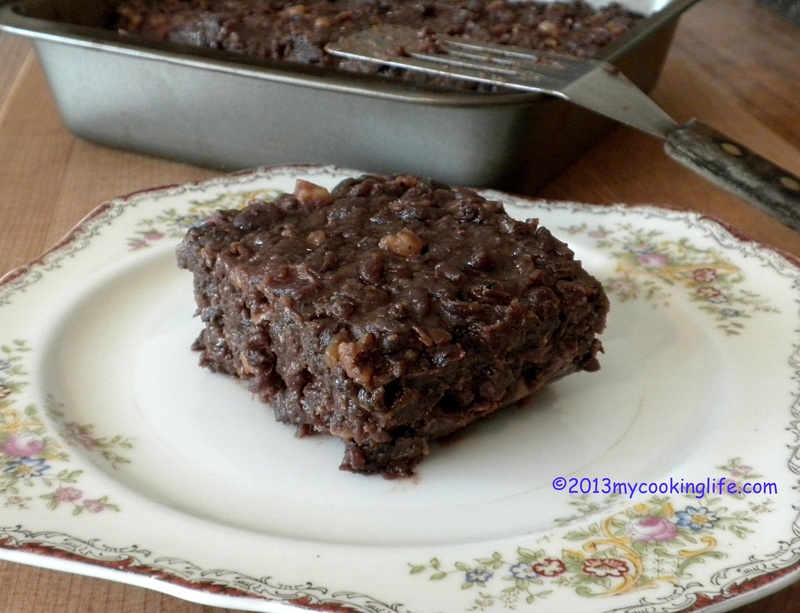 This entry was posted in Beans, Cooking, Food, Vegan and tagged aduki beans, barley malt, Miso, not pretending to be brownies, vegan protein snack by mycookinglifebypatty. Bookmark the permalink. I’m OBSESSED with beans but I’ve never heard of aduki beans!! I wonder if I can get them here in Australia… Would love to try this delicious looking recipe!! Thank you. I sure hope you can because they have a delicious, subtly unique flavor of their own. If they aren’t in your natural foods store, you can try mail order. Thanks! I will start having a look around! You are always surprising me with your suggestions! Who would have thunk–bean squares with currants and walnuts? Sounds very intriguing, Patty. It’s different all right, Kathy! Seriously interesting combo. I do like aduki, and can get them organic here. As for the miso, I just might have to find a sub. Do love anything malt! Let me know what you decide to use instead of miso. If there isn’t any in your stores you can try mail order.